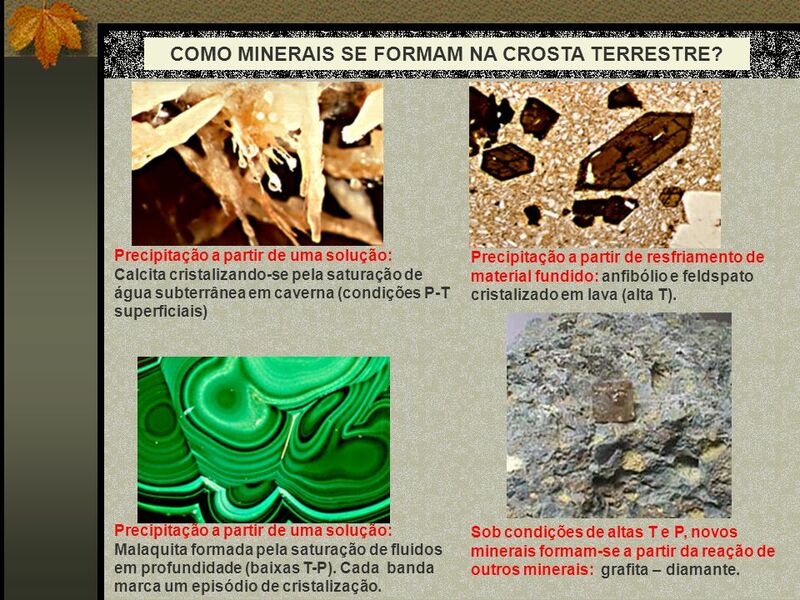 3 COMO MINERAIS SE FORMAM NA CROSTA TERRESTRE? 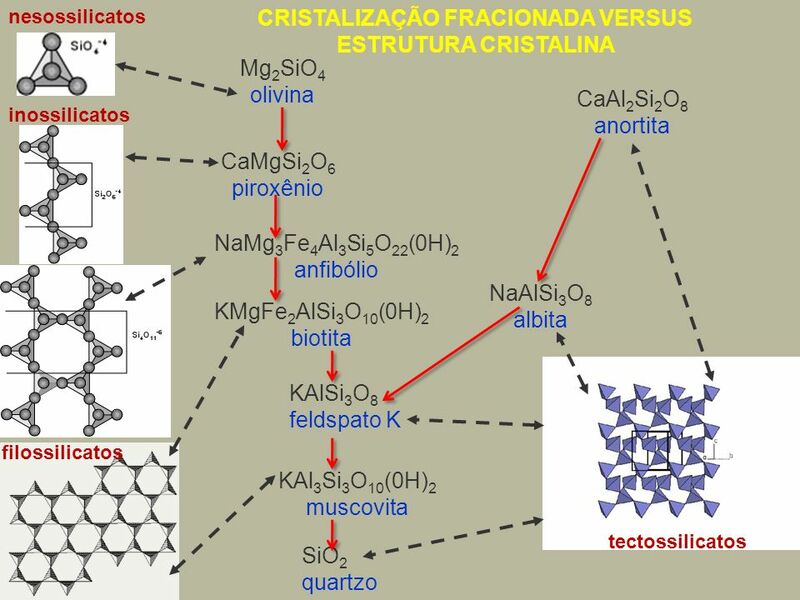 Precipitação a partir de uma solução: Calcita cristalizando-se pela saturação de água subterrânea em caverna (condições P-T superficiais) Precipitação a partir de resfriamento de material fundido: anfibólio e feldspato cristalizado em lava (alta T). Precipitação a partir de uma solução: Malaquita formada pela saturação de fluidos em profundidade (baixas T-P). Cada banda marca um episódio de cristalização. Sob condições de altas T e P, novos minerais formam-se a partir da reação de outros minerais: grafita – diamante. 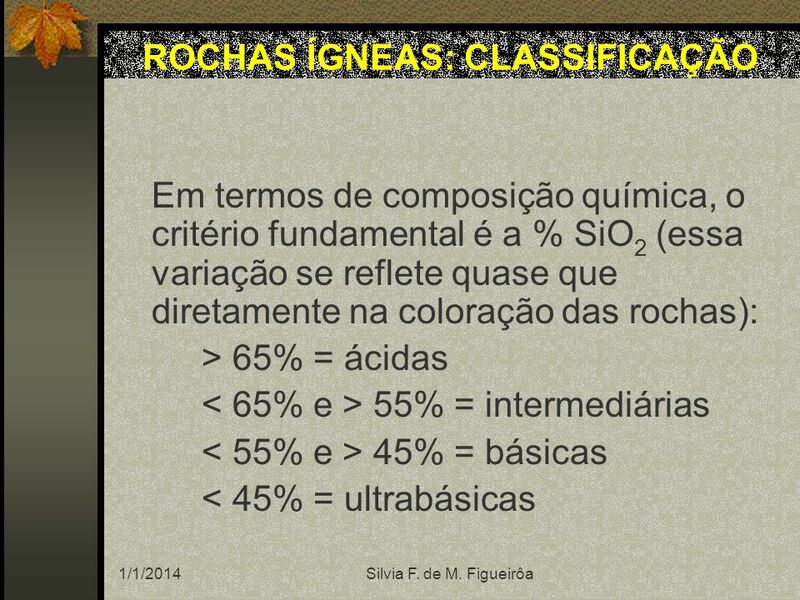 4 O que é uma rocha? 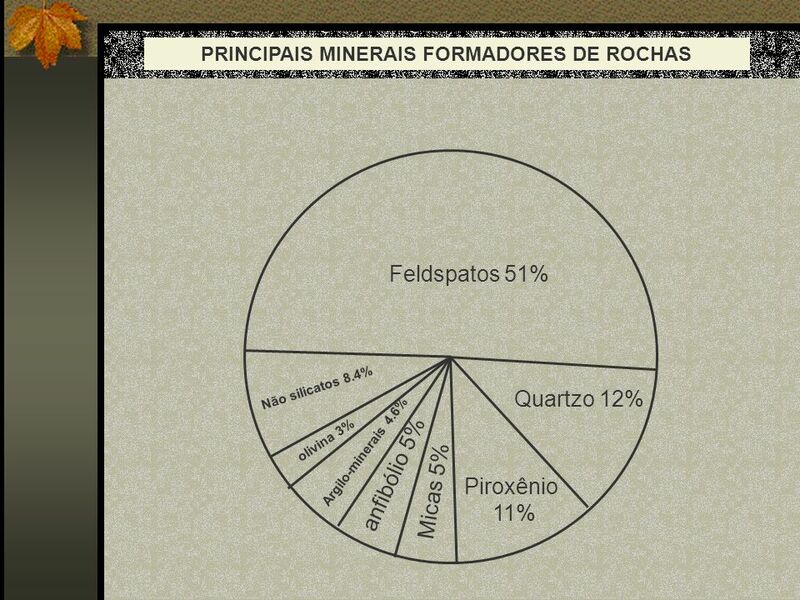 Rochas são agregados naturais multigranulares, uni ou poliminerálicos – isto é, constituídos de um único tipo ou de vários tipos de minerais. 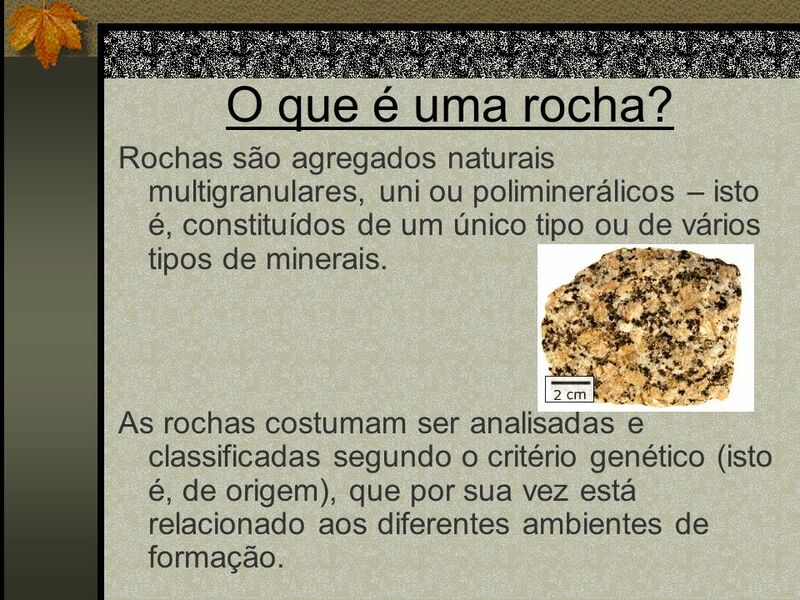 As rochas costumam ser analisadas e classificadas segundo o critério genético (isto é, de origem), que por sua vez está relacionado aos diferentes ambientes de formação. 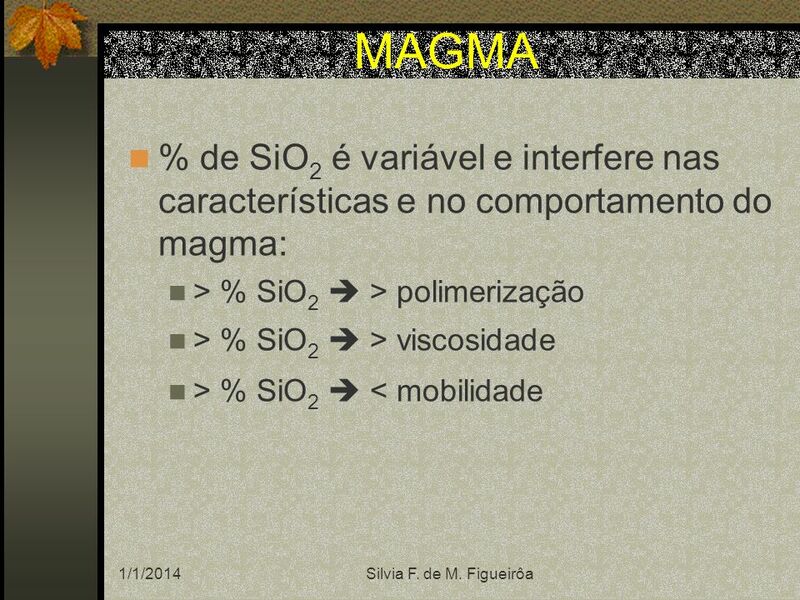 MAGMA Massa pastosa constituída por tetraedros de (SiO4)4- e (AlO4)4- (fundido alumino-silicático) unidos por cátions (Fe2+, Mg+2, Ca+2, Na+, K+). 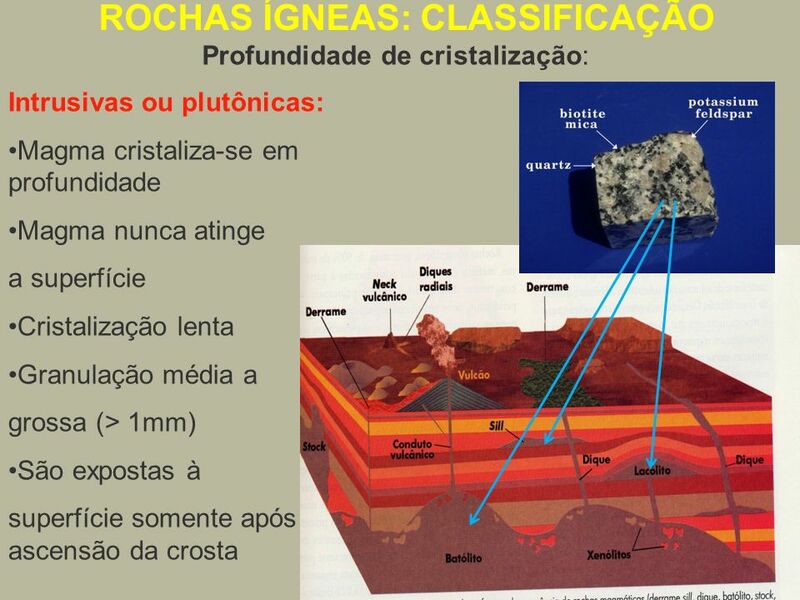 T= 650°C a 1200°C Fases sólidas neo-cristalizadas (silicatos, óxidos, sulfetos). 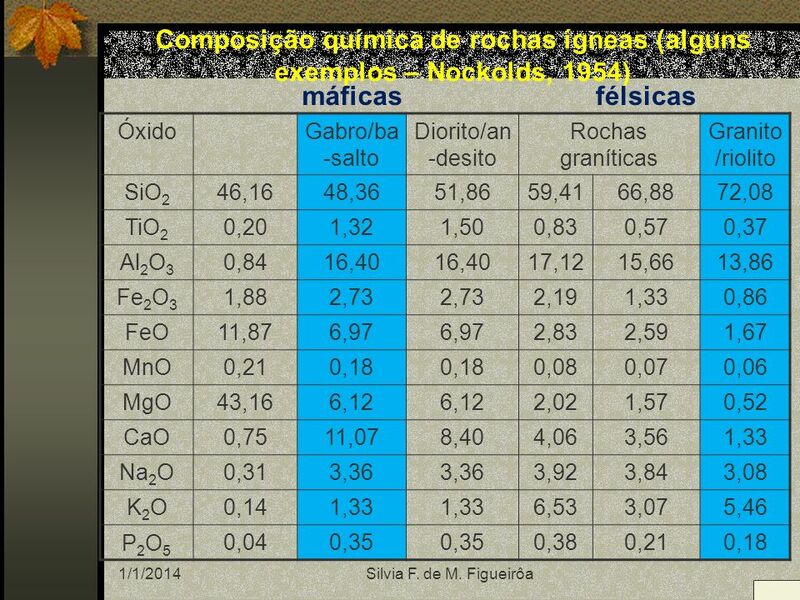 Fases voláteis dissolvidas ou em processo de degaseificação (bolhas)  H2O mais abundante; CO2, compostos de S (H2S, SO2, SO4), HCl e HF em concentrações significativas. 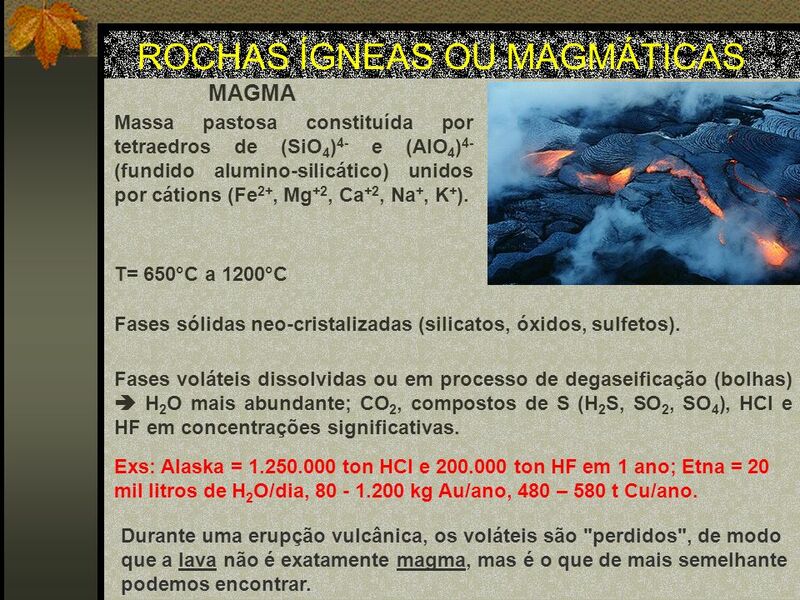 Exs: Alaska = ton HCl e ton HF em 1 ano; Etna = 20 mil litros de H2O/dia, kg Au/ano, 480 – 580 t Cu/ano. Durante uma erupção vulcânica, os voláteis são "perdidos", de modo que a lava não é exatamente magma, mas é o que de mais semelhante podemos encontrar. 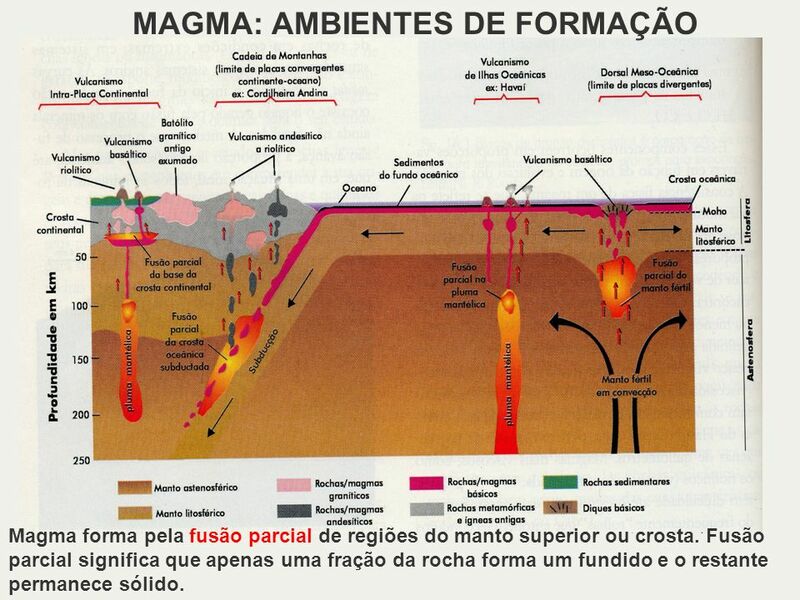 Magma forma pela fusão parcial de regiões do manto superior ou crosta. Fusão parcial significa que apenas uma fração da rocha forma um fundido e o restante permanece sólido. Rochas máficas = escuras Bowen's Reaction Series has two branches. They are: Discontinuous reaction series, from olivine to biotite,. Continuous reaction series, from Ca plagioclase to Na plagioclase. The discontinuous reaction series involves the dark-colored ferromagnesian minerals: olivine pyroxene amphibole biotite. As a magma cools, olivine crystallizes first. The olivine crystals react with the remaining magma to form pyroxene. Pyroxene reacts with the magma to form amphibole. Amphibole reacts with the magma to form biotite. Each successive mineral, from olivine to biotite, has a different composition and a different silicate crystal structure. As crystallization proceeds, the crystal structures become more complex (olivine has an isolated tetrahedral structure, pyroxene has a single chain structure, amphibole has a double chain structure, and biotite has a sheet structure). The series of minerals is called discontinuous because a series of different minerals is formed, each with a different crystal structure. The continuous reaction series involves the plagioclase feldspars. Plagioclase feldspars are an example of a "solid solution series", exhibiting gradations in chemical and physical properties. Chemically, this series consists of two "end members": albite or Na plagioclase (NaAlSi3O8), the sodium "end member", and anorthite or Ca plagioclase (CaAlSi2O8), the calcium "end member". There is a continuous chemical and physical gradation between the two end members. (Various plagioclase mineral names are given, based on the percentages of calcium and sodium present, including anorthite, bytownite, labradorite, andesine, oligoclase, and albite). Ca-plagioclase is the first to crystallize. It reacts with the melt to become more sodium rich. (If reaction is not complete, a zoned plagioclase crystal results which has a calcium-rich center and sodium-rich edges). This series of plagioclase minerals is called continuous because all of the plagioclase minerals have the same crystal structure. 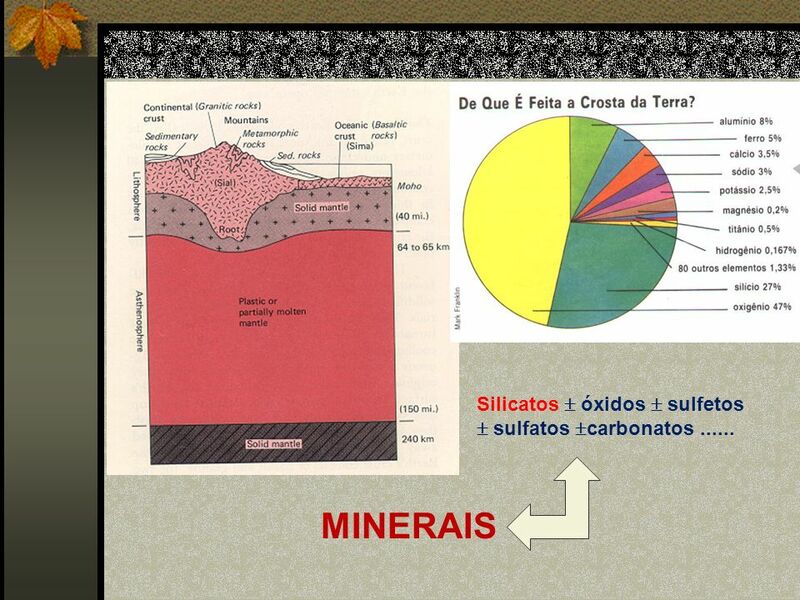 The minerals differ primarily in the proportions of calcium and sodium present. During the last stages of crystallization, potassium feldspar (KAlSi308) crystallizes. Muscovite may also form. If the remaining melt contains excess silica, quartz will crystallize. Bowen's Reaction Series helps us to understand why certain minerals tend to occur together in igneous rocks. For example, the mafic rocks, basalt and gabbro tend to contain olivine, pyroxene, and calcium-rich plagioclase feldspar. These are all minerals which crystallize at high temperatures. As another example, felsic or sialic rocks such as granite and rhyolite tend to contain quartz, potassium feldspar, sodium-rich plagioclase feldspar, and sometimes muscovite. These are minerals which crystallize at lower temperatures. The minerals that ultimately form are controlled by the initial composition of the magma. Bowen's Reaction Series also helps us to understand why certain minerals do NOT occur together in igneous rocks. For example, olivine and quartz are unlikely to occur in the same igneous rock, because olivine is a high temperature mineral, and quartz is a low temperature mineral. 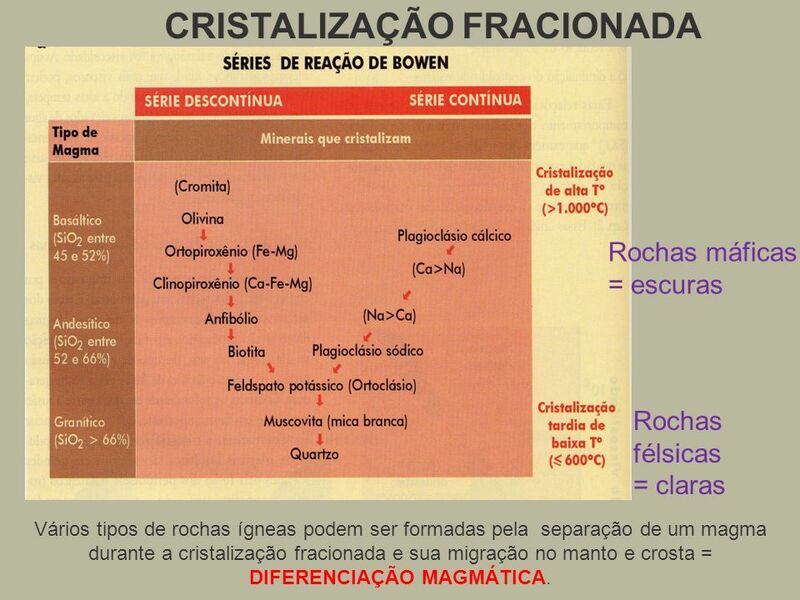 Bowen determined that specific minerals form at specific temperatures as a magma cools. 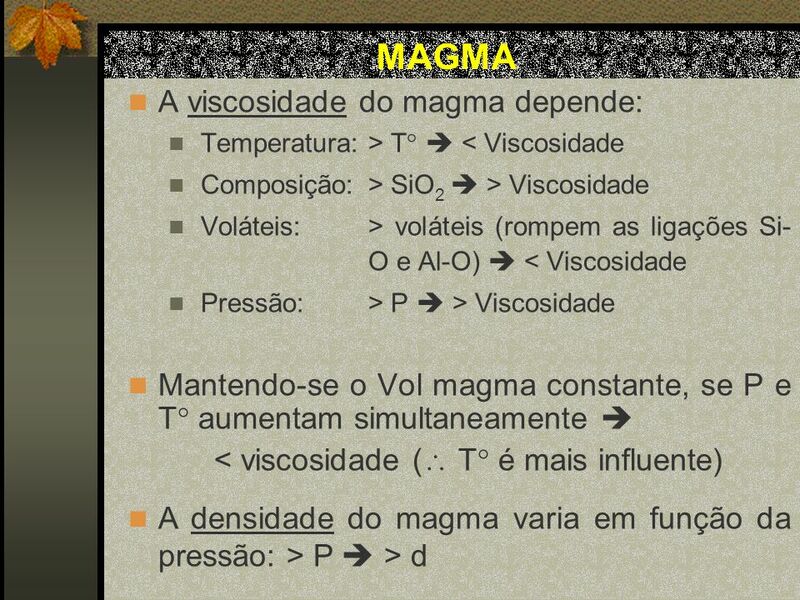 At the higher temperatures associated with mafic and intermediate magmas, the general progression can be separated into two branches (see below). The continuous branch describes the evolution of the plagioclase feldspars as they evolve from being calcium-rich to more sodium rich. 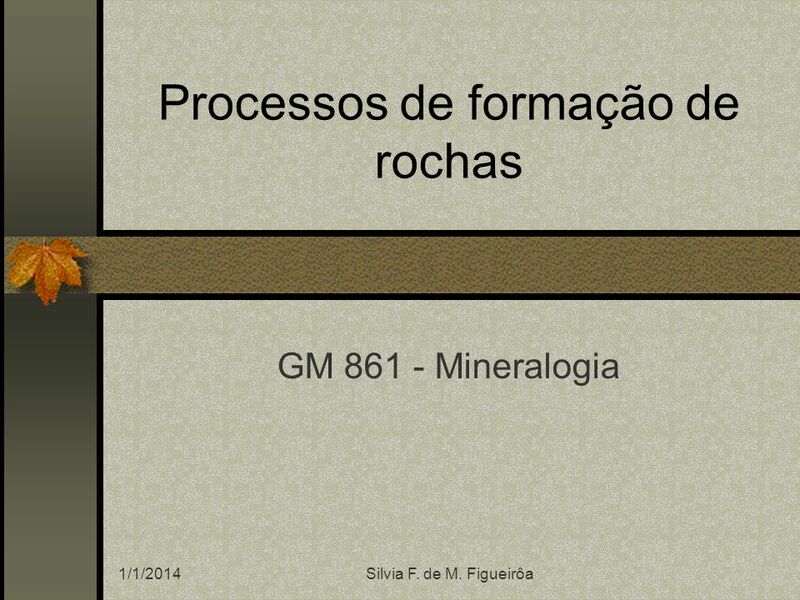 The discontinuous branch describes the formation of the mafic minerals olivine, pyroxene, amphibole, and biotite mica. The remarkable thing that Bowen found concerned the discontinuous branch. 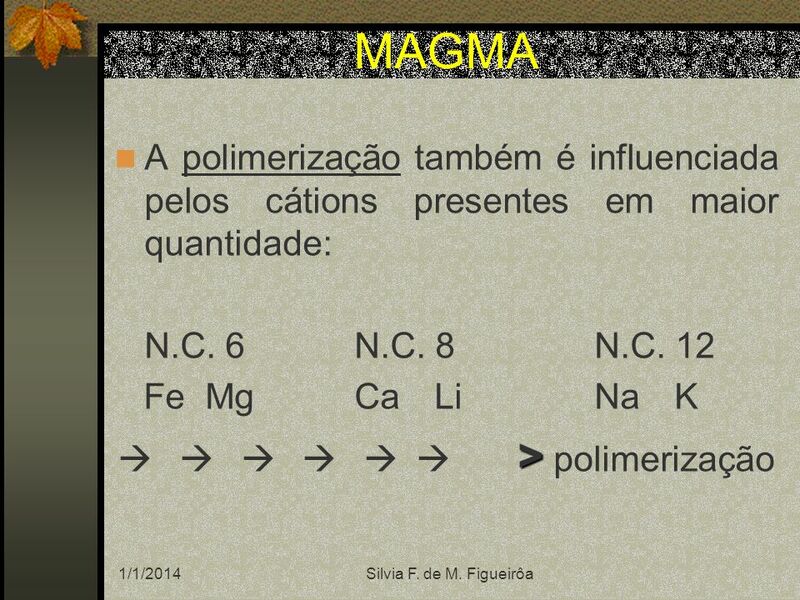 At a certain temperature a magma might produce olivine, but if that same magma was allowed to cool further, the olivine would "react" with the residual magma, and change to the next mineral on the series (in this case pyroxene). Continue cooling and the pyroxene would convert to amphibole, and then to biotite. Magmatic Differentiation: With this term we describe the process of separating the magma into several batches (separating crystals from melt) as it evolves and migrates upwards in the earth's crust. E.g. we might early on separate olivine and pyroxene (crystal mush), and would thus create a peridotite (more mafic than basalt). The remaining melt would crystallize pyroxene, hornblende, and plagioclase with intermediate Ca content (andesine), and might erupt from a volcano and form andesite. Or, if the material remained buried, the crystal fraction would form a diorite from which in turn a granitic melt would rise. The parental magma that Bowen envisioned was a "primitive" basalt with high Fe and Mg contents and fairly low SiO2 contents. 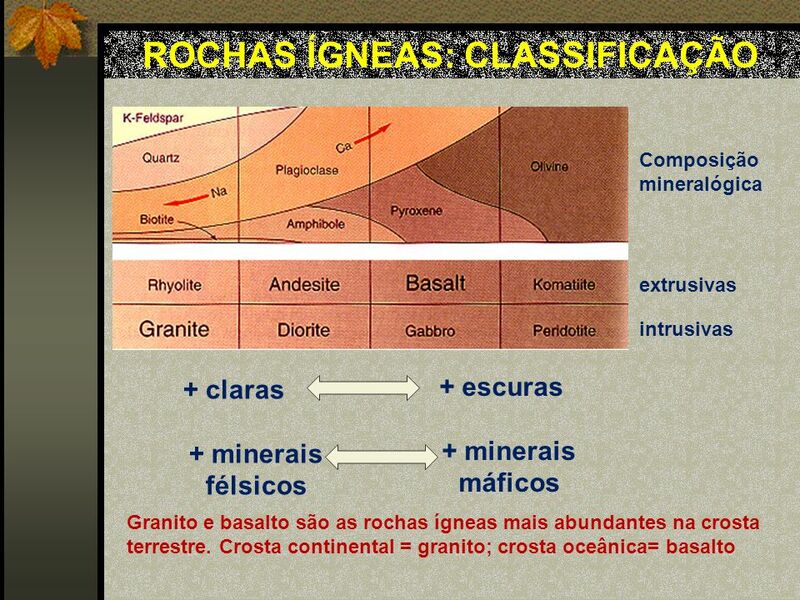 This gradual change in mineral composition during differentiation is accompanied by a change in color (mafic rocks dark, felsic rocks light) and density of the respective rocks, and is the basis for most of the accepted classification schemes of igneous rocks. 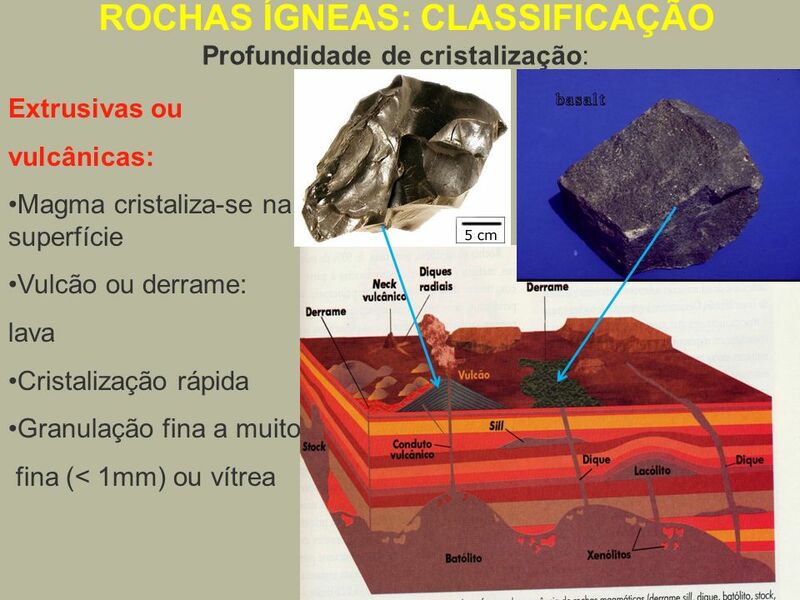 The original composition of the magma of course determines the variety of igneous rocks we can derive from it. 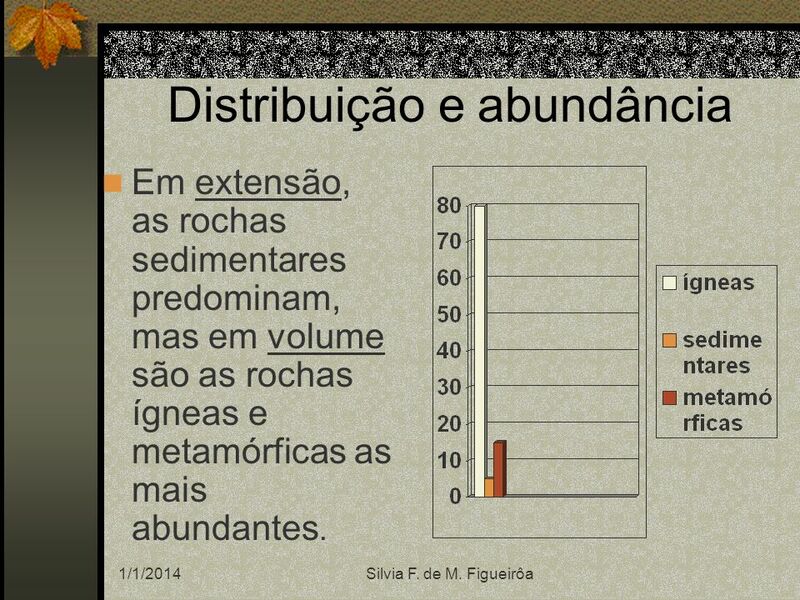 An originally dioritic/andesitic magma for example could never give rise to a basalt, but may give rise to a granite. A magma may be modified by mixing with another magma that is further or less far evolved, and then rocks of unusual mineral composition may form. Another way in which a magma can be modified is by assimilation of wall rock during its rise through the crust. 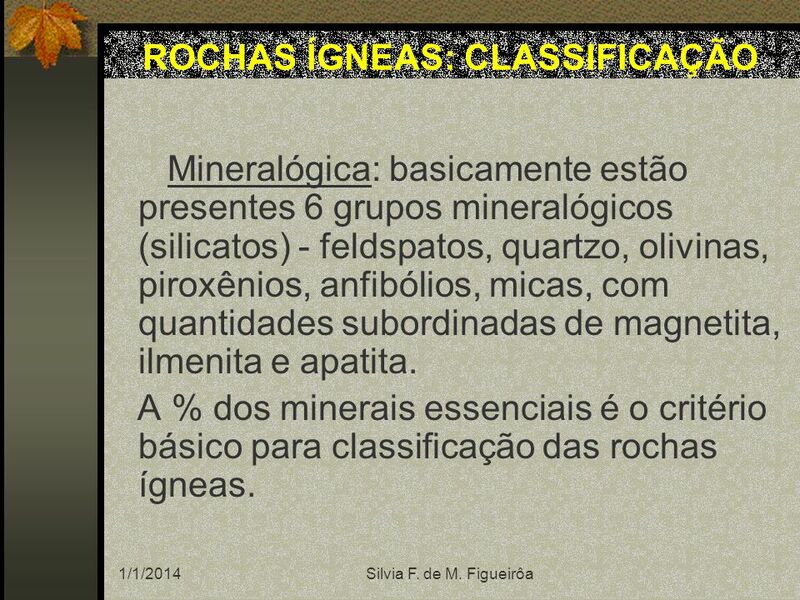 Rochas félsicas = claras Vários tipos de rochas ígneas podem ser formadas pela separação de um magma durante a cristalização fracionada e sua migração no manto e crosta = DIFERENCIAÇÃO MAGMÁTICA. 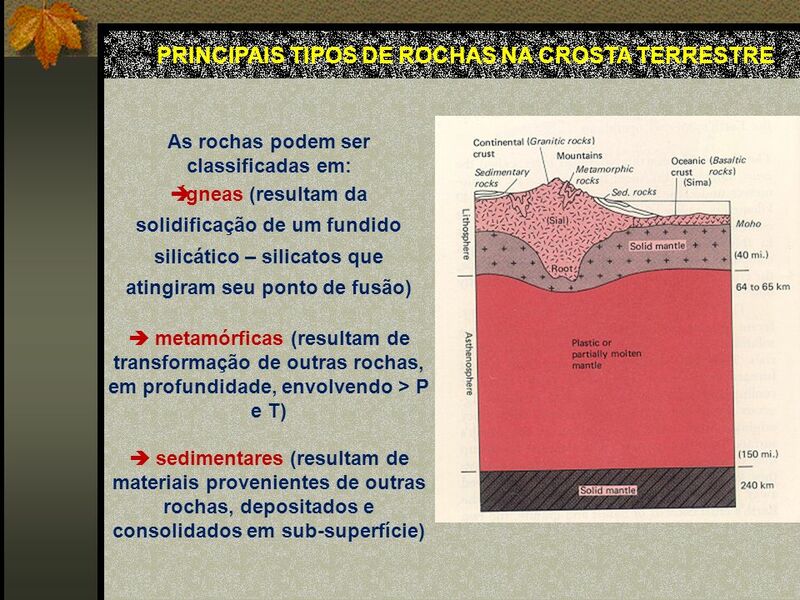 Carregar ppt "Processos de formação de rochas"
Rochas Magmáticas Ambientes tectónicos nos quais ocorre formação de magmas: A – zona de afastamento das placas; B – zona de colisão de uma placa continental.